This bundle includes a breakout, hyperdoc, and choice board. Also sold separately. 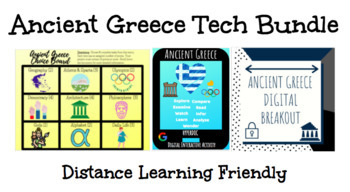 Looking for a digital breakout covering Ancient Greece? If so, then this is the document for you! All you need is connection to the internet! This breakout is on a Google site. A digital breakout has students find a series of online clues to unlock "locks." Breakouts are a great way to increase student engagement in the 21st century. The 4Cs are incorporated as students must collaborate, communicate, create, and think critically! You and your classmates are on a tour of Ancient Greece and have suddenly gotten lost! You have tried to back track but still can't seem to find the others from your group. The only way to find your way back is to solve the puzzles below. Will you find your tour group or will you be stuck in Greece forever? Answer Key Included! 45 min time limit is suggested. Purchased document is a Word doc that includes a Google Link with the breakout. Google Drive and Google Classroom ready! You may also be interested in my Early Humans Breakout, Ancient Egypt Breakout, Ancient India Breakout, Ancient China, Ancient Rome, or Mesopotamia Breakout. Are you looking for a way to make a topic more engaging, technological, and interactive? Well, then this is the product for you! 100% digital, this doc can be used to introduce or reinforce the study of Ancient Greece. Product includes the link to the doc site. Must have internet access. Doc is web-based. Video link is from YouTube. It may be blocked by school filter. If so, show the video whole class. You may need to create a Padlet, FlipGrid and Answer Garden link for a few of the activities. Some activities may require Adobe flash. Part of my Ancient Civilizations Hyperdoc Bundle. This activity includes 9 activity squares that address different multiple intelligences based on the study of Ancient Greece. 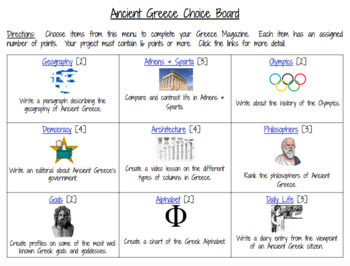 This menu of activities can be used as a formative or summative assessment of Greece. It includes ranked activities by points and a variety of activities that assess different aspects of Greek culture. Activities can be modified for your group and/or unit of study. Includes grading rubric. Compare and contrast Athens and Sparta. Which would you prefer? Write an editorial about Ancient Greece’s government. 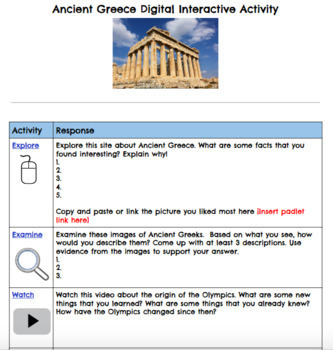 Create a video lesson on the different types of columns in Greece. Rank the philosophers of Ancient Greece. Write a diary entry from the viewpoint of an Ancient Greek citizen. Download includes a link to the choice board and rubric. Each activity is linked to a separate document that gives a more thorough description of the assignment. Document can be easily shared through Google Drive or Google Classroom. Part of my Ancient Civilizations Hyperdoc and Choice Board MEGA Bundle. Be sure your school district gives students access to documents from outside of your school district. © Copyright 2018 Project Based Sixth. All rights reserved. Permission is granted to copy pages specifically designed for student or teacher use by the original purchaser or licensee. This is intended to be used by one teacher unless additional licenses have been purchased. The reproduction of any other part of this product is strictly prohibited. Link may not be shared.